This exciting adventure is great for someone wanting more of a homestay experience. Based at our simple, comfortable campus in a suburb of Guinea’s capital Conakry, you will enjoy the local markets and community living. This trip includes lots of cultural immersion, an incredible 3 day trip to the rain forest, as well as a 3 day trip to an extraordinary tropical island. A great first-time-to-Africa trip! Transportation to/from and accommodations in the beautiful Village of Kindia! Day 1: Arrive in Guinea! *NOTES: Students focused on drumming can replace the morning dance class with a drum class, and are encouraged to drum for the afternoon dance class. We always offer separate dance & drum classes for Beginning & Intermediate and Advanced levels, so you can get the most value from your level specific dance and drum classes. Shorter or longer stays can be arranged. We also offer substantial multi-trip discounts. Contact us for specifics. ... you wake up to the distant sacred call to prayer, chickens clucking and a warm breeze across your face. First off, you eat some of Guinea's famous rice porridge with the best banana you have ever tasted, fueling your body for your first morning dance class. Ahhh, African Dance ... IN AFRICA! After the more-extraordinary-than-you-have-ever-heard-before drumming and amazing personalized dance instruction stops, you catch your breath while meeting each of your new African family members, each one more beautiful, polite and excited to meet you than the last. 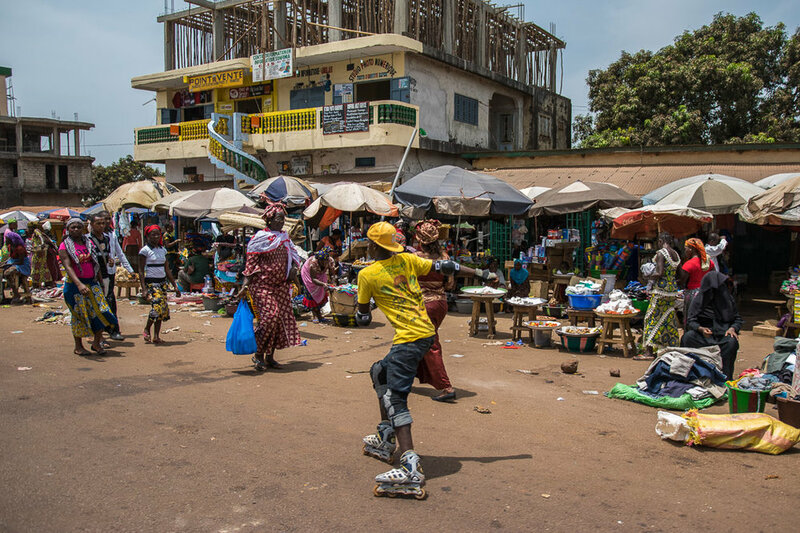 You clean yourself up, eat some salad and you’re off to the market with a couple of new friends ... bargaining down the price on a mask, and negotiating your way through the busy streets of Conakry. You can’t wait to work with the Tailor to design just the right outfit with the fabric you just bought! You make your way back home just in time for drum class, where you learn the very rhythm you danced to this morning. Now, saturated with this rhythm, you join the others in your second fabulous dance class of the day – you have enough time and attention to really get the moves. Dinner is prepared with love and attention - hospitality beyond which you have experienced before. After dinner: hair braiding, language lessons, laughing and connection. Finally, tired and full, it is time for bed ... tomorrow holds a trip to see Les Ballets Africains rehearse, and a big wedding party. As you drift off to sleep to the sweet melodic sound of the balaphone, you think to yourself, wow, this really is going to be the trip of a lifetime!